McAfee Host Intrusion Prevention for Desktops safeguards your business against complex security threats that may otherwise be unintentionally introduced or allowed by desktops and laptops. Host Intrusion Prevention for Desktops is easy to deploy, configure, and manage. Comprehensive security — Three layers of protection (signature analysis, behavioral analysis, and dynamic stateful firewall with global reputation technology) prevent intrusions, protect assets, and defend your company against known and emerging exploits, including zero-day attacks. Advanced vulnerability shielding — Stronger protection against exploits that target new vulnerabilities means your IT staff has more time for planning, testing, and deploying patches. Automatic updates — Security content updates are delivered automatically to target specific vulnerabilities and block emerging threats (including buffer-overflow attacks) from executing. Customized security control — Easily apply different levels of protection based on location (corporate network, VPN, or public network). Host Intrusion Prevention travels with the laptop and can provide varying degrees of protection, depending on whether you are in the office, at home, or on the road. Enhanced security powered by McAfee Global Threat Intelligence — McAfee Global Threat Intelligence (GTI) is a comprehensive cloud-based threat intelligence service. Already integrated into McAfee security products, it works in real time, 24 hours a day, to protect customers against cyberthreats across all vectors — file, web, message, and network. McAfee GTI offers the broadest threat data, most robust data correlation, and most complete product integration in the industry. McAfee’s GTI network allows enabled products to evaluate threats on multiple vectors in real time, leading to faster identification of threats and higher capture rates. Host Intrusion Prevention for Desktop uses the McAfee GTI network connection reputation service to identify suspicious domains/IP addresses that are infected or hosting malware attacks, and block those attacks. Managing security and controlling connectivity for desktop and laptop computers across an organization is increasingly challenging with the growing number of profit-driven cybercriminals and the sophisticated nature of today’s threats. As workers become increasingly mobile, that places additional pressure on IT to ensure that users connect safely to the corporate network. Additionally, organizations need zero-day protection against threats to gain more time to be able to properly prioritize, test, and deploy the necessary patches. Prevent intrusions, protect assets, and enforce intrusion prevention system (IPS) and zero-day threat protection coverage at all levels: network, endpoint, and application. Integrated reputation-based global intelligence in the desktop firewall (Microsoft Windows only) blocks threats such as botnets and denial of service before attacks can occur. Trust McAfee behavioral protection to secure endpoints against unknown attacks. Our signature protection identifies and blocks known attacks while a stateful firewall applies policies, bars unsolicited inbound traffic, and controls outbound traffic. Protect and manage all desktops across your entire enterprise with the McAfee ePolicy Orchestrator (ePO) console, the scalable, centralized platform for easy deployment, management, reporting, and auditing. Apply different levels of security using rules based on the endpoint’s connection — on the corporate network, over VPN, or from a public network — with connection-aware protection. Count on automatic security content updates targeting specific vulnerabilities to recognize unknown exploits and stop them from executing. Security content updates do not require system reboots, and updating signatures is similar to updating .DAT files. Anti-virus alone is not enough, as attacks and vulnerability exploits are being released faster and are becoming more complex. The solution is to implement a proactive security strategy that prevents attacks from happening in the first place. With a proactive approach to securing endpoints, IT departments can ensure that all endpoints and confidential data are protected and business continuity is maintained. As an integral part of McAfee endpoint suites, McAfee® Host Intrusion Prevention for Desktop delivers unprecedented levels of protection from known and unknown zero-day threats by combining signature and behavioral intrusion prevention system (IPS) protection with the industry’s only dynamic, stateful firewall. McAfee Host Intrusion Prevention for Desktop reduces patching frequency and urgency, preserves business continuity and employee productivity, protects data confidentiality, and simplifies regulatory compliance. Unlike traditional system firewalls that rely on specific rules, McAfee Host Intrusion Prevention for Desktop has integrated McAfee Global Threat Intelligence™ network connection reputation to secure desktops and laptops against advanced threats such as botnets, distributed denial-of-service (DDoS), and emerging malicious traffic before attacks can occur. With the increase in advanced threats, McAfee Global Threat Intelligence offers the most sophisticated protection you can deploy. Additional firewall features, such as application and location policies, further safeguard laptops and desktops especially when they are not on the corporate network. A large percentage of exploits are released as early as three days after disclosure of the vulnerabilities. Yet, for many organizations, it may take up to 30 days to test and deploy patches for all endpoints. McAfee Host Intrusion Prevention for Desktop bridges the security gap while making the patching process easier and more efficient. Out-of-the-box protection boasts a superior track record. McAfee Host Intrusion Prevention for Desktop protects against an average of 97 percent of exploits1. Protection is provided against both Microsoft and Adobe vulnerabilities. Laptops and desktops are vulnerable during startup because the security policies have not yet been enforced. During this vulnerable startup time, endpoints could be subject to network-based attacks and security services could be disabled. McAfee Host Intrusion Prevention for Desktop blocks attacks from occurring during this vulnerable window with firewall and IPS startup protection. Creating and maintaining multiple firewall and IPS policies is necessary in a large organization but is usually tedious and time consuming. McAfee Host Intrusion Prevention for Desktop policy and IPS catalogs streamline that process, allowing you to create and maintain multiple firewall and IPS policies that can be applied to different groups of users and reused as needed. Virtualization has been adopted by practically all IT departments, and compatibility with the major virtualization platforms is essential for any product to be successful. 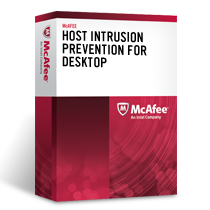 McAfee Host Intrusion Prevention for Desktop is compatible with the three major virtualization platforms, VMware, Citrix, and Microsoft Hyper-V. The following table lists the supported products from each of these three vendors. Download the McAfee Host Intrusion Prevention for Desktop Datasheet (PDF).